The ground walnut in this soap gives it a beautiful natural dark brown color as well as the characteristic of imparting a little “grittiness”. 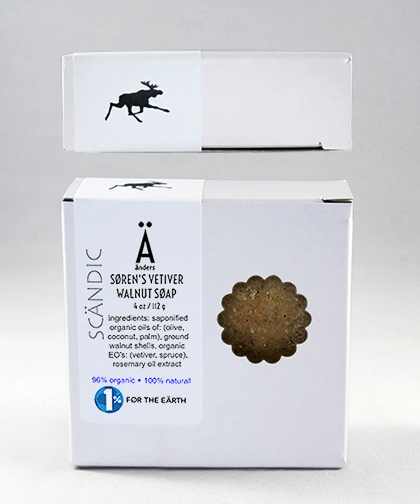 We then add the organic essential oils of Vetiver and Spruce to create a very pleasing Scandinavian soap. This essential oil is steam distilled to impart a powerful earthy-smoky scent. It blends well with frankincense and myrrh along with patchouli. A very strong scent, this oil is used extensively in aromatherapy and skin care. Ground walnut shells that impart a dark brown color and add a slight exfoliate to the soap.